In a small bowl, combine flour, baking power, soda, cinnamon, salt, and nutmeg. In another bowl, combine milk, egg, oil and vanilla; stir into the dry ingredients until well combined. 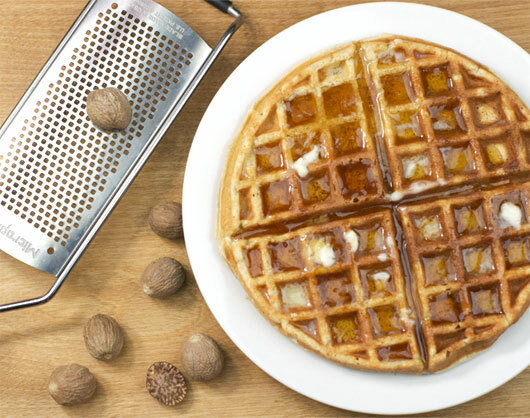 Bake in a preheated waffle iron according to the manufacturers directions. (Most recommend NOT using cooking spray if it's already non-stick, however I use cooking spray for this recipe because there's so little oil in the batter.) Cook until golden brown and lid lifts easily. 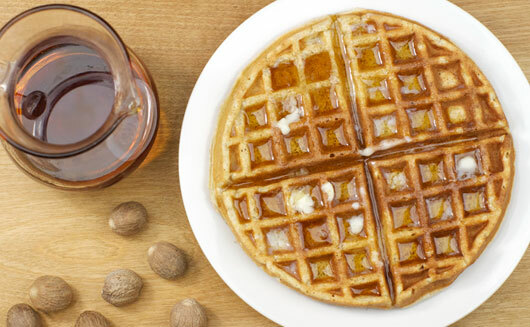 2 waffles (without butter & syrup) have 198 calories and 3 grams of fat (1 g saturated.) You can reduce the fat by using egg whites or egg substitute if you desire. Recipe number 2591. Submitted 7/30/2009.